The dance theoretician Thoinot Arbeau writes in a treatise printed in 1588 that every ball always opened with a branle. So why not open this album with a branle! 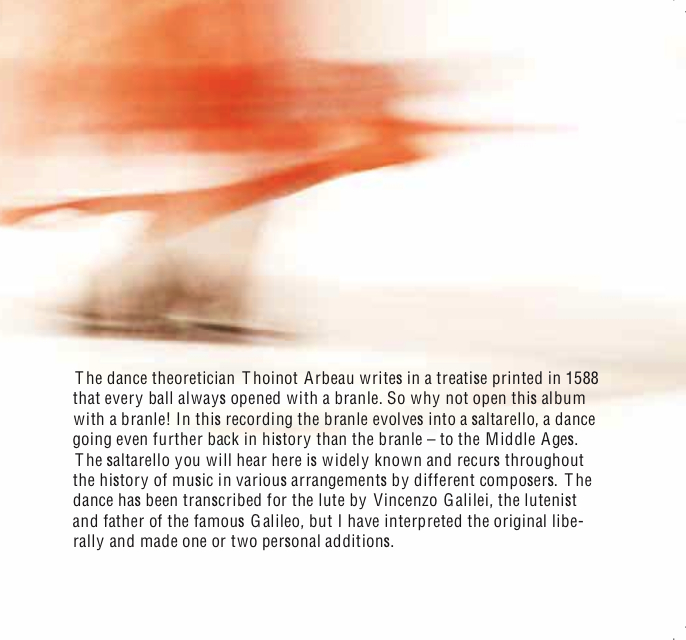 In this recording the branle evolves into a saltarello, a dance going even further back in history than the branle – to the Middle Ages. The saltarello you will hear here is widely known and recurs throughout the history of music in various arrangements by different composers. The dance has been transcribed for the lute by Vincenzo Galilei, the lutenist and father of the famous Galileo, but I have interpreted the original liberally and made one or two personal additions.